There's no bad time to visit Buzios the sun shines all year round. Now its up to you to hurry up and decide when you'll be here ! Búzios has no bad time of year. So anytime is a good time to visit this enchanting seaside village. With average temperatures around 25ºC there is no such weather as too hot or too cold. Of course, Búzios does have both busy and quiet times of year like any city. Years. In addition many people from the city will manage to take longer three-day weekends in the summer so these days of the week can be quite crowded. If you enjoy the crowds and love to meet new people then definitely plan a visit during this time. Just be sure to make reservations early and be aware that prices can be higher. For visitors to Búzios who do not like raucous partying at night and crowded beaches during the day, plan on visiting between April and August. There will be no wait to get into your favorite restaurant for dinner and you can probably find a beach where you and your lover will be all alone to enjoy a romantic day for two. In addition it is easier to get last minute reservations during this time and the prices are a bit lower than the high season. Winter months are still quite warm and there is less likelihood of rain. The beginning of the shoulder season in September is a good time to visit Búzios if you prefer a more peaceful visit. However, if you enjoy a small crowd but nothing too excessive, head to Búzios in November when the town is just beginning to gear up for the busy months. Expect prices to be a bit higher in November than September but you can still find great deals. 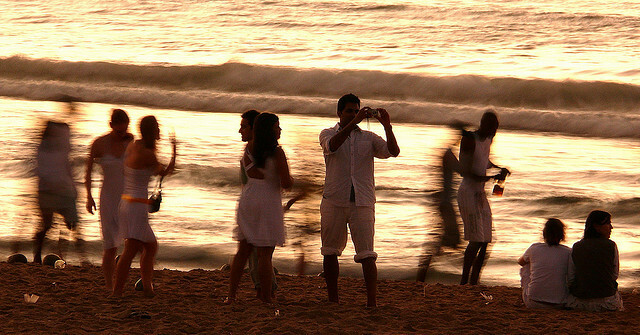 For the partier, there is nothing like Búzios during the summer with loud music, loud people and loud beaches. For the quieter crowd plan on coming to Búzios during the winter months when there are fewer visitors and you can have the peninsula to yourself. Buzios is a well known destination 169 km from Rio de Janeiro. More than 20 marvelous beaches with white sand and clear water in a city with a big infrastructure of restaurants, nightclubs, shopping spots and hotels.